Yesterday afternoon was Mr. L’s turn to spend some time using my longarm and having a turn at quilting. Once again, we started with a practice piece. 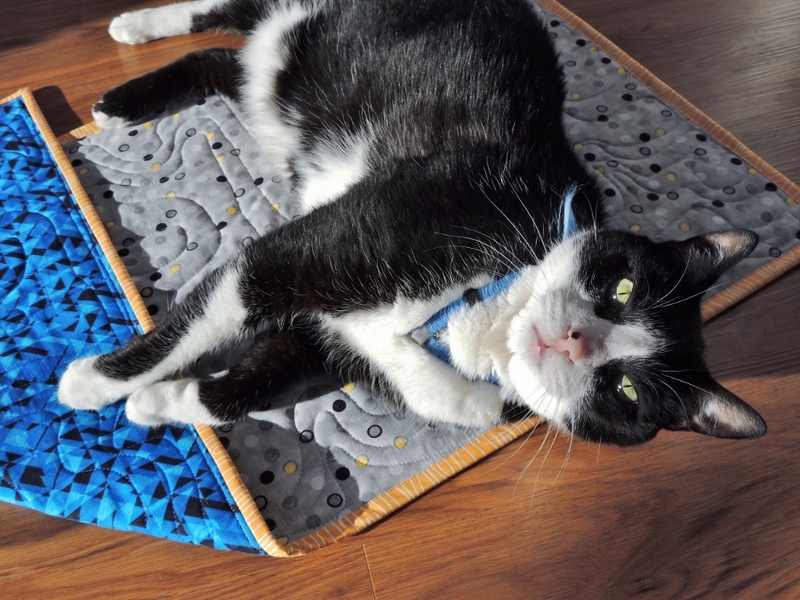 Puppy the cat heartily approves of the mini quilt. 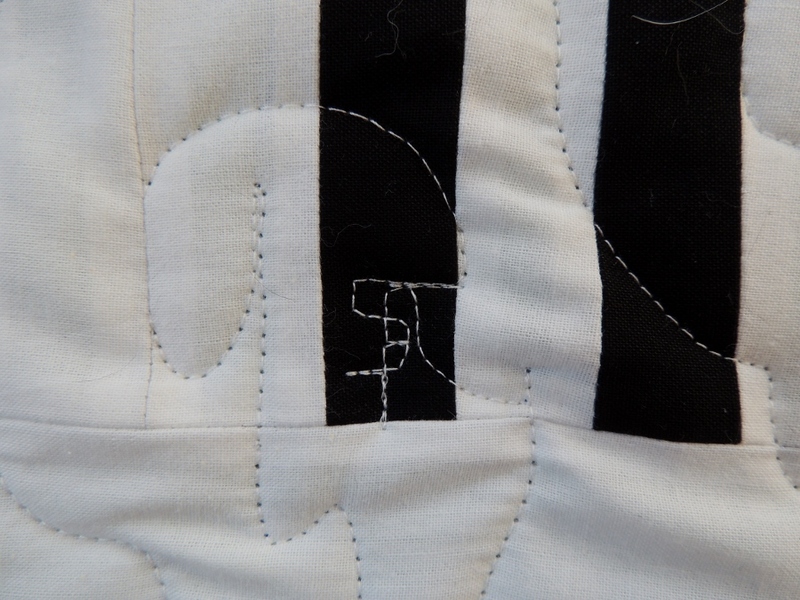 I really liked the organic wavy lines that Mr. L quilted – he had great control and did some amazing echo work. I thought that the pattern looked a lot like topographical maps. As Mr. L was getting familiar with how my long arm felt to move, I told him how I picked out the top fabric for the mini quilt (the backing fabric is the same backing fabric he selected for the back of his quilt). I know he is a San Francisco Giants fan, so I looked for a gray and orange fabric. I didn’t have any on hand and I asked if the dot fabric worked for him. He got really excited and said he likes the circles and dots, but to make it more awesome he quilted in some SF logos as well. Working with Mr. L and Miss A has been so wonderful – they are fearless and do beautiful work! Because there was no orange in the gray fabric, Mr. L picked out an orange fabric for the binding which pops really well with the blue backing fabric as well! Mr. L placed 11 different SF logos across his quilt top. When he came to the Cows in a Barn block by Jasmine @Quilt Kisses, he quilted the largest version of the logo. 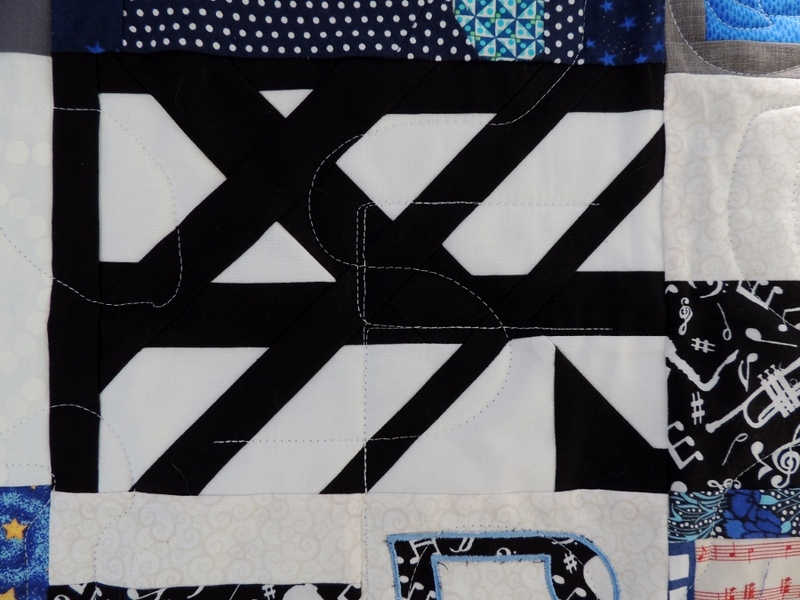 And on one of the black keys of a border block he quilted his smallest. So delightful to read this post Yvonne. You and Mr. L and Puppy had a fabulous time together! He did just great! I love that both the children just dived right in and had a ball. You are a wonderful teacher for sure! It looks like Puppy has claimed the mini quilt for himself! 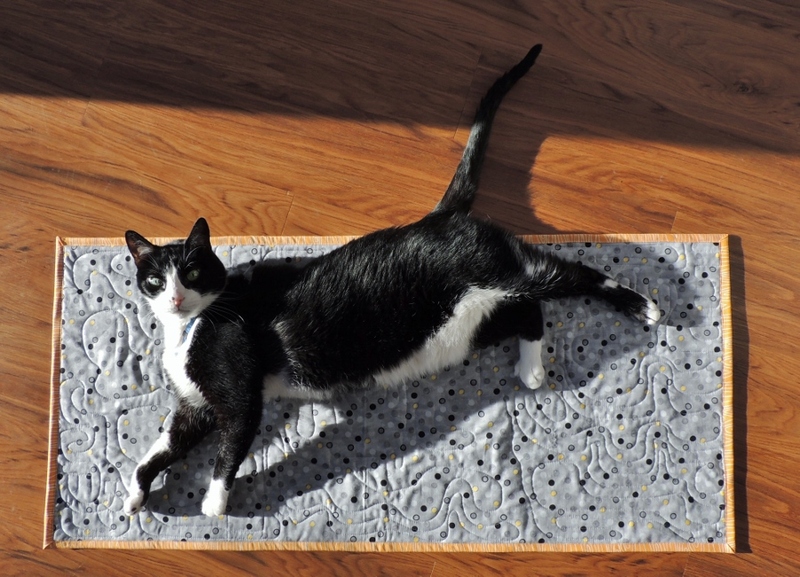 Every cat needs a quilt laid out in the sun for stretching and napping on. Did you turn off the stitch regulator for him? Sounds like such a fun day for the both of you! I bet both kids are SO excited to have these quilts. I must have the only cat in the world that wants nothing to do with quilting. He never makes an appearance in the sewing room. Well done on the long arm Mr. L.
Great job Mr L! 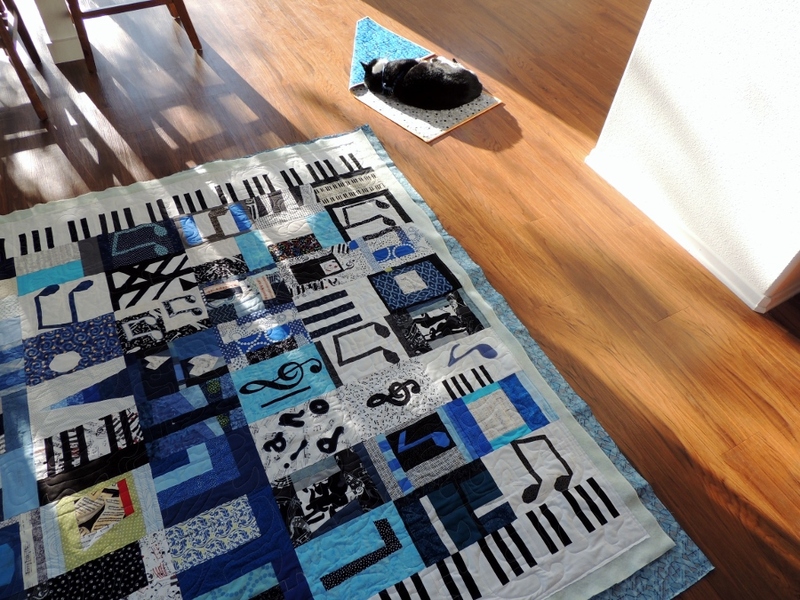 And the patience it took for him to do both the mini and the quilting on the music note quilt. Of course when you are having fun it’s not as much work. And the SF logo he quilted is such a fun little additive to make that quilt all his. Puppy looks quite serious in the one picture. I’m not sure I would have been brave enough to take the mini quilt away from him. I am chuckling about your cat being named puppy. ;P Clever. Mr. L did a good job on those SF’s. I was thinking the same Rachel-love that the cat is called ‘Puppy”. Mr L did a great job on his quilt and how wonderful for you to teach him Yvonne. I’m sure both the children have had fun quilting their quilts. Wish I was that fearless when it comes to free motion quilting! Great job, Mr. L and Puppy for claiming the quilt! I, too, love to speed! Great job, Mr. L.
LOL, the need for speed 😀 Mr. L did a great job! He also has a natural talent for this and the fearlessness definitely helps! So cool that he was able to finish his top! Another successful quilting adventure, how fun. Mr. L’s quilting looks awesome! So glad you and he enjoyed the experience. And Puppy cat seems to like it, too. Totally cool quilting, Mr. L!!! Yvonne, your posts have inspired me to get my grandchildren onto my longarm. They have some piecing to do first, but it’s in the cards! Mr. L did some great quilting! And Puppy just cracks me up. He would steal the show every single time if you let him, wouldn’t he? My family got a laugh out of Puppy the Cat. 🙂 I am still so impressed by his quilting. I just helped a niece with a quilt today on my mom’s long arm. She is such a perfectionist that she loved the digitized quilting. 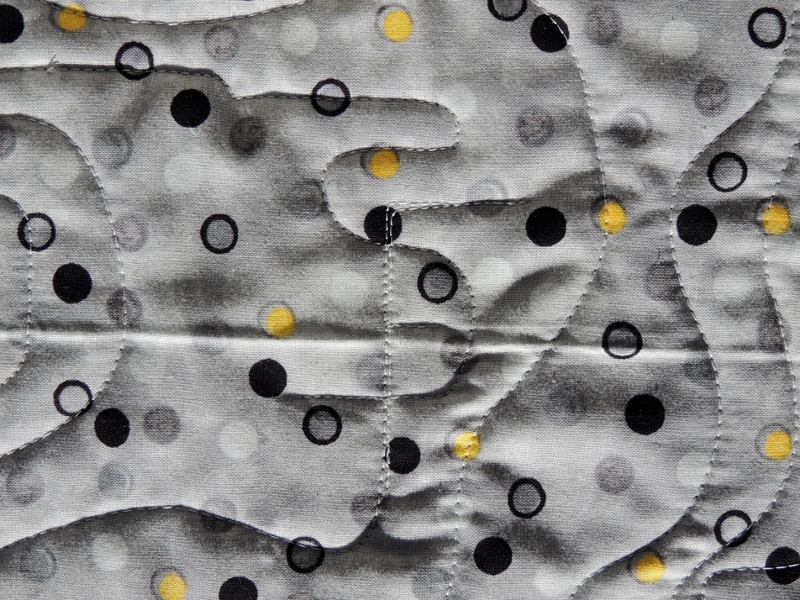 I have to say that I really love his free motion quilting!!! Puppy felt the need to supervise closely, I see. Haha! I can totally picture Mr L racing the machine from side to side! He really did do a great job!! Love your cat’s name and love how Mr L was so speedy, I think maybe you were the perfect person to get him going in that respect! The quilt looks brilliant too, how great that he has details hidden away in there that are meaningful to him.